“Who are you?” This question may be a strange way to begin a reflection, but it’s one that I had to ponder throughout my ISP trip. “Who am I? Where am I from? What is my nationality?” For many of us, these questions are easy and can be answered fairly quickly: my name is Belen Fresno, I am from Spain, and my nationality is Spanish. Some of you may be able to say that you are American, Italian, English, etc; however, what if you were stripped of your nationality? Who would you be? Where would you belong? What would you say your nationality is? On June 2, 2018, a group of Scranton students, faculty and I embarked on a journey that would change our lives forever. Twelve of us were chosen to go on the ISP Dominican Republic-Caribbean Social Immersion Program trip. As stated in the name, our type of service would not be physical in nature. We would not be able to see any tangible evidence of service being done, such as building a house. On the other hand, our trip was presence-based and focused around immersing ourselves in the incredible culture we were surrounded by. 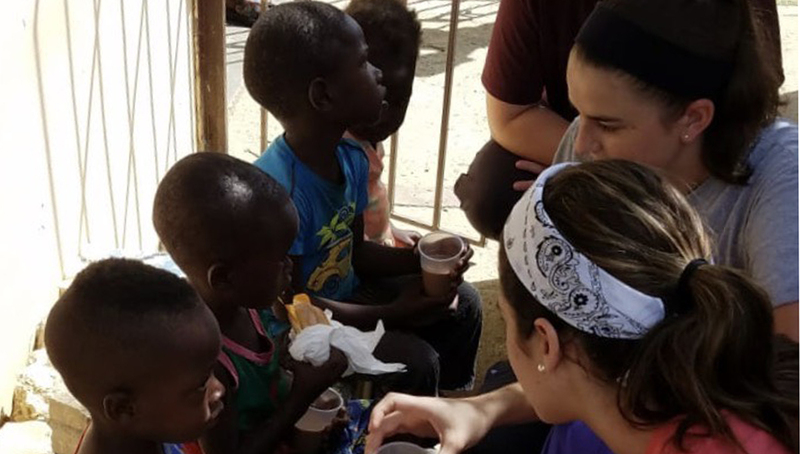 At first, it was hard for me to understand how an immersion trip could be considered service; I couldn’t wrap my head around how service could also be something abstract. I was aware that we would be interacting with people in different areas of the country for a majority of the time and we would have the opportunity to ask about their lives. However, to me, it still seemed like a normal conversation that I could have with anybody, anywhere. I often asked myself how having conversations with the people from the Dominican Republic (DR) was going to help? The main aspect of our trip consisted of understanding the political and socioeconomic problems that the DR is currently facing. These primarily consisted of the injustice being done against Dominicans of Haitian Descent and the fight that young people had placed upon themselves to regain their rights. This story begins a long time ago, in the beginning of the 20th century, when sugar corporations hired Haitians to work in the DR sugarcane fields. Many Haitians made the decision to go to the DR since it gave them opportunities to receive jobs and the possibility to be able to build better lives for themselves and their families. As time passed, those Haitian immigrants began to establish lives and families in the DR and have been living in the DR since then. In 2007, a resolution was passed which temporarily suspended all national identification documents for Dominicans of Haitian descent. In the DR, in order to exercise any civil or political rights, one needs a document called “la cédula” (a form of ID similar to a driver’s license and social security). Without this ID, one cannot buy a car, buy a house, go to school or university, open a bank account, or even get something as simple as a cellphone. This resolution was only the start of a wave of events that stripped Dominicans of Haitian descent of their rights and nationality. In 2013, a Constitutional Court sentence denationalized these people and later in 2014, a new law was approved that seemed to provide pathways to allow a legal residency for these people -although still not a nationality- but ends in a legal maze for the applicants. At this moment, this law is being fought in court by groups that do not want any legal right to this population. This separation continued to rid these people of their rights, making them feel less than human and easily exploited. From this injustice, in 2011, the movement “Movimiento Reconocido” began. “Reconocido” is the Spanish word for recognized. Their main goal is to fight back against these injustices and regain the rights that their country has wrongfully taken away from them. Throughout our trip, we met with a variety of people who are affected by these resolutions. We were especially touched by the works of Ana María Belique and her colleagues who helped to start the Reconoci.do movement. Ana María’s life was changed when the 2007 resolution came out. She is one of ten children and her parents emigrated from Haiti years before she was born, making her a Dominican of Haitian descent. When she discovered that she was one of the many being affected by these resolutions, she decided to courageously stand up and begin a battle against her government with no idea of how it will end. Ana Maria, alongside four other Dominicans of Haitian descent, are the founding members of the Movimiento Reconoci.do. They were, and still are, on a mission to educate the affected people. They advocate for their rights, help them get their IDs, and most of all try to change these rulings so every Dominican of Haitian descent can be treated as any other Dominican. They are all human and deserve to be treated as so. For someone to make the decision to stand up against one’s government is not easy, especially when one is the minority. Something that has impacted me was when Ana Maria said, “if we’re afraid, we won’t do anything…and that’s what they want,” in response to me asking if she was ever scared. "It is truly amazing how the smallest of gestures can make someone’s entire day." Her story is one of many that we heard in our 8 days in the country. While there, we also visited the bateyes, which are the sugarcane communities owned and operated by large corporations in which many Dominicans of Haitian descent work. The visits to the bateyes were difficult but also moving. The living conditions these people live in were shocking to see. Some bateyes had no electricity nor running water, and malnourished children ran around barefoot amongst glass and rusted pieces of metal scattered on the floor. In these communities, the men would work in the sugarcane fields day in and day out, while the women have to stay home, cooking, cleaning and taking care of the children. While walking around the bateyes, it was a challenge to accept that that was the way they had to live, but in all that misery, the littlest of things made the people glow. Our team had brought candy, soccer balls, and Polaroid film for the communities we visited, and every time we took those out, the atmosphere shifted. Everybody was smiling from ear to ear while playing soccer, people were taking photos of themselves and with their friends, all while filling their hands and mouths with as much candy as they could. It is truly amazing how the smallest of gestures can make someone’s entire day. When we spoke with members of the communities, it made me realize that even in the worst circumstances, when their own country treats them as worthless, they are still able find joy in their lives regardless of the materialistic things they may lack. For myself, this was the biggest takeaway from my trip: that I’m able to be truly happy without all the “stuff” that fills my life back home. In the DR, I did not have my phone nor makeup, and I packed limited clothes and supplies. There were many aspects of living in the DR that were unlike home, such as being careful of the food we consumed, not being able to drink tap water, not putting toothbrushes under the sink, and the inability to throw toilet paper in the toilet but instead in the trashcan. Even though these things at first seemed like a pain, especially when not being able to talk to people at home, not having air-conditioning, and not being able to do many of the basic things I am used to doing every day without a second thought, it made me realize how much importance I used to give to things that were not making me truly happy. ISP has given me the opportunity to see where I want my life to go. Deep down inside of me, I’ve always known that my life couldn’t simply consist of graduating, getting married, having kids, getting a job while living in a house with a white-picket fence. Don’t get me wrong, all those things are great, but I personally feel that I’ve been called to do something different, something more. Currently, I am still processing my experience and how the two trips that I have done with ISP have shaped my life. Right now, I don’t have any set plans for my future, but this trip in the DR has taught me to not be afraid to fight for what I believe in, and that one person can make a real difference in the lives of others. To conclude this reflection, I would like to leave you with the words of Isidro Berique, another affected leader of Reconoci.do who accompanied us throughout the trip. When I asked him his meaning of the word “life” he responded with “la vida es para: vivir, amar, y servir” (In life we are meant to: live, love, and serve).